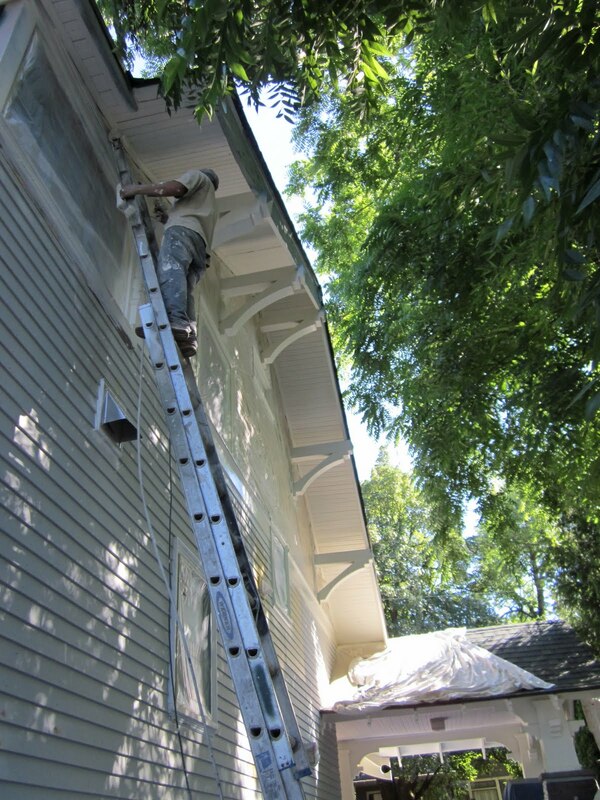 Exterior painting is clearly a plastic-intensive process. The paint crew spent literally days masking and more masking, then they would spend an hour or two painting. It has been really interesting to watch the process. To start, the painters went through and primed all the new wood. Then they pressure washed and scraped the old paint. Next, they went through and masked the glass on the old windows. They also masked the yellow-stained shingles. They sprayed the wood mullions with the dark green paint. Then they went through and masked the entire window with a second layer of plastic, leaving the trim around the window exposed. 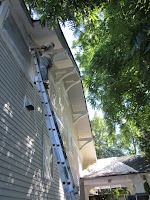 Next, they went through and sprayed the trim-work with the white paint we chose. By this point, it was getting pretty eerie inside the house. Then, as expected, they wrapped up the white trim with MORE plastic. They then went through and painted the yellow body paint. Here were the two paint samples they put up for us. The right hand sample is the yellow that matches the stained shingles; the left hand sample is 50% darker. We chose the darker yellow. By this evening, the crew had started removing the layers of plastic and the house colors were starting to emerge.